If you’ve followed us on Facebook, you’ll know it’s been a busy and varied summer. Bill has been involved in Eastman’s Summer Horizons with young music students in his wonderful program “Creative Music Making”. We will be presenting that program at Ithaca College in early September, so stay tuned, as it will be open to anyone who wants to participate. Bill also was part of a remarkable reunion of Rochester Philharmonic Orchestra percussionists spanning fifty years! 2:10 Morris: The name “Tocalo Tucson”? 4:50 Bill: The history of Nexus and use of improvisation? 24:23 Morris’s interest in refurbishing and selling Rogers drums. 55:15 Are there roles that the Nexus members played in the ensemble? 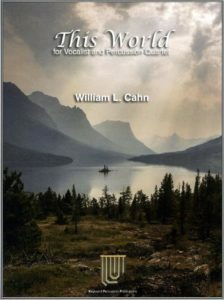 Last but not least, Bill’s beautiful piece “This World” – music for voice and 4 percussionists – is now available from Keyboard Percussion Publications. “This World”, performed by NEXUS with soprano Katherine Ciesinski, can be heard on the “Home” digital album (NEXUS # 10959) at cdbaby.com – Keywords: NEXUS Home. The audio download price for “This World” as a single is $3.99. Check it out!